Have you heard of +Post ads from Google? Do you know how your company can benefit from them? Google’s +Post ads give your content assets massive visibility. In this article you’ll discover what +Post ads are and how you can use them to promote your content to an even wider audience. Your audience is bombarded with more content than they can consume (Mark Schaefer calls it content shock). That information overload is blocking your visibility and marketing efforts. You may be creating compelling content with blog posts, infographics, images or videos, but that content is limited by the walls of social media channels and your existing readers. 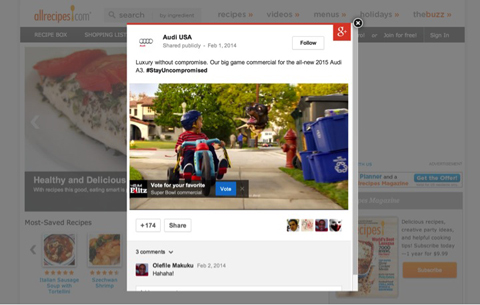 An expanded Google +Post ad from Audi. +Post ads help you break free from those limitations so you can get your content and marketing message in front of millions of people—the right people. With Google +Post ads, you pay to promote your valuable Google+ content as an ad on relevant third-party websites. You can promote any of your public content—pictures, videos, updates, hangouts—everything! The good news is that +Post ads are not within the Google+ stream (hooray!). Instead, they’re served through Google’s Display Network and you can handle them through your AdWords account. If you’re not familiar with Google’s Display Network, it’s a paid ad service that shows your ads (e.g., your +Post ad) on relevant websites and to the audiences most likely to be interested in your product or service. 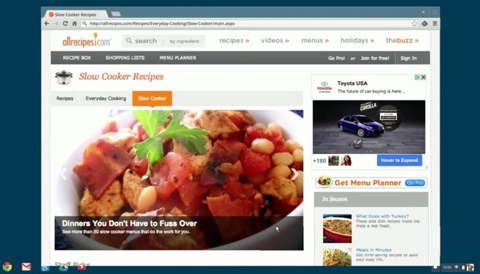 In the example below, you can see Toyota’s +Post ad on AllRecipes.com. +Post ads use your Google+ updates as targeted ad content across a range of related websites. Of course, anyone can see your +Post ad content, but what’s special about these ads is that users who are logged into Google can reshare, +1 or comment on your content right in the ad, without going to Google+. And if your content includes a link to your site, users can click through. Each interaction is seamless for the user. 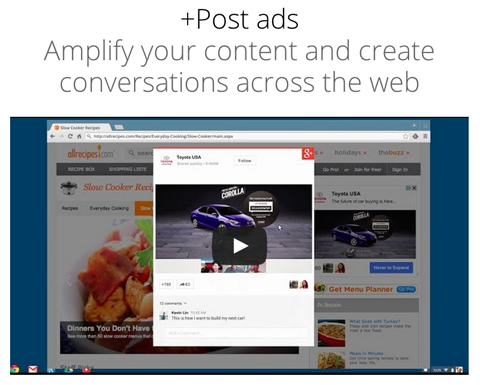 +Post ads are interactive for users logged into Google+. Right now, if you want to use +Post ads, you need to be a qualified brand on Google+ (you need to have over 1,000 followers). If you don’t yet have 1,000 Google+ fans, bump up your efforts to get more attention and expand your circles. Since +Post ads use your Google+ updates, it’s important for those updates to look their best. 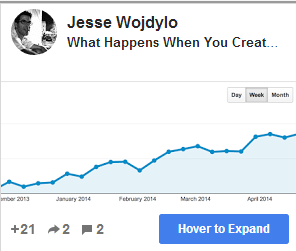 Optimizing your Google+ content so your ads look great means you’ll get the interaction you want. For maximum shareability and interaction (both on Google+ and your +Post ad), use compelling images and/or videos, powerful content, clear calls to action and +Post formatting (i.e., bold, underline and italics). As you create your update text, keep in mind that shorter +Post ads with a link have a higher click-through rate. Example of a 300 x 250 pixel Google +Post ad. Here are the different ad sizes and how they would look. Examples of differently sized Google +Post ads. 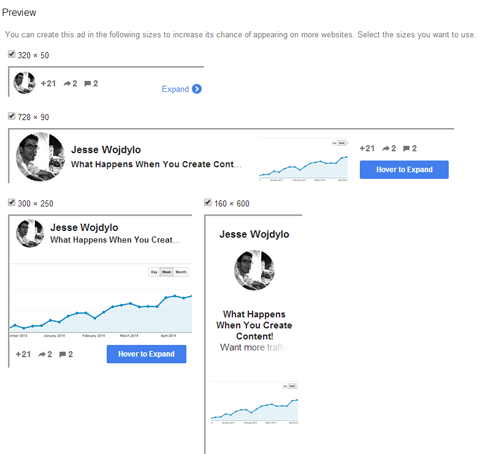 In this hangout on air, Google+ expert Jesse Wojdylo describes a few more ways you can create Google+ posts that encourage sharing (and will likely work well as +Post ads). Optimizing your Google+ updates means your +Post ads are also optimized. And as you’d expect, when new audiences see a relevant, useful ad, they’re more likely to interact with it. The actual mechanics of creating and using Google +Post ads are simple. The infographic below will help you get up and running. Instructions and tips for setting up and running +Post ads. Believe it or not, Google +Post ads and Facebook ads make excellent bedfellows. +Post ads and Facebook custom audiences can work together to help you find, track and market to more people in your target audience. If you’re not familiar with Facebook custom audiences, here’s a quick overview. Custom audiences allow you put a conversion pixel on different pages of your website (e.g., a landing page or conversion page). When someone visits a page with a conversion pixel, Facebook gathers that person’s Facebook profile information and uses it to serve your ads to similar people (the ones who are most likely to be interested in your message). How does that relate to +Post ads? If you create a +Post ad that includes a link to a specific page on your website, you can install a Facebook conversion pixel on that page. 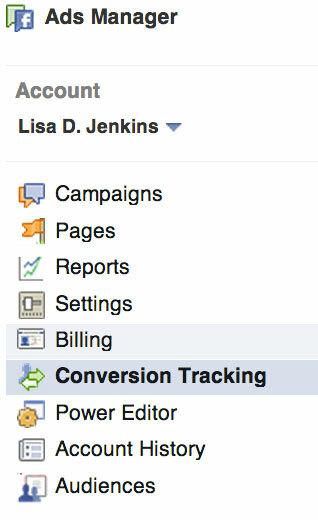 Creating a Facebook Conversion Pixel in the Ads Manager. Because your +Post ad has the potential to reach millions of viewers via the Google Display Network, you can increase the number of people who match your target market for Facebook ads. That’s really helpful for your future Facebook ad campaigns. With the additional information on new leads, you can run different Facebook remarketing campaigns to continue promoting your content. For example, you can create a custom audience of previous website visitors to show ads for your latest blog posts. The difference between standard Facebook remarketing and +Post ads is that Facebook ads rely heavily on calls to action to drive conversions. +Post ads use your thought leadership (via your Google+ updates) to create that connection with new audiences. With +Post ads, you’re no longer limited by AdWords’ restrictive ad types. Instead, you have complete control over your +Post ads because they work seamlessly with your Google+ content. Peg Fitzpatrick’s Google+ update captures attention with a tall, skinny image and compelling content. You can continue to use Google+ updates to build brand loyalty with your current followers, then use that same content to reach an even larger targeted audience with +Post ads. That kind of exposure lets you start conversations with your current audience and beyond. Sharing optimized, interesting and useful Google+ content via +Post ads helps you grow your Google+ circles, deepen your connection with existing fans and find new people to join your community. What do you think? Have you used +Post ads? Do you have advice for others? Share in the comments below! Marcela De Vivo is CEO of Gryffin.com, a boutique social media, SEO, and content marketing agency, blogs at The Alchemy, and specializes in Google Penalty Recovery and Link Building.